RV's of Texas Service • "Making Customers for Life"
RVs of Texas Mobile Service LLC technicians are craftsmen who take our work very seriously and operate with Integrity and Professionalism. We work directly with factories and dealers, helping them resolve on-going problems. 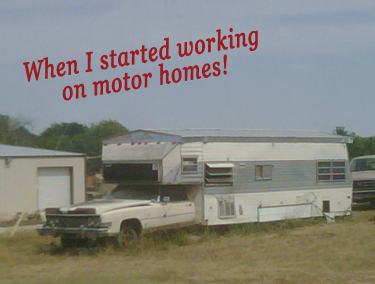 I am certified in every aspect of RV repair, have stacks of RV school certifications, and have trained many RV techs in Texas. I have given RV seminars Nationwide at FMCA Rallies, Good Sam and other RV Clubs. Most work, such as rubber roof repair can be done on site. We also rebuild walls and I specialize in electrical work and troubleshooting. 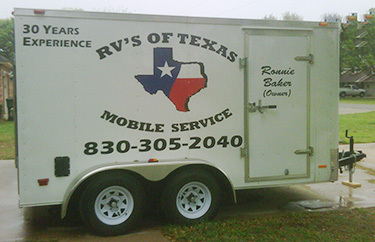 RVs of Texas Service is authorized for service by most manufacturers and parts vendors. We work with extended service policy companies for the best coverage. We are insured and bonded for your protection, whether you are an individual customer or an RV park with multiple customers. Our prices are reasonable and we work hard to complete your repair work in a timely manner. I am very proud of my accomplishments and will do my best to make you a customer for life. We are proud to say that we have many customers that are very happy with our service and we look forward to doing business with you. Welcome to the RVs of Texas Service Website. We serve central and south Texas, if you need RV Roof service we will expand our normal service area, please contact us for details.